I last made this dish– and started a post on November 6, 2010 (ah, drafts box). But, as tasty as this dish is, I was wholly unsatisfied with the picture– and it took me, oh, a few years to remake and reshoot. This dish is made to share— because it is basically a vat of bacons, egg and pasta– mmmm… Come to think of it– why isn’t this a more standard brunch dish? What is great about this America’s Test Kitchen recipe– is that it does not use cream– it is has this ingenius method of heating a bowl, mixing in raw eggs, which cook as you mix them. Very clever guys. Adjust oven rack to lower-middle position, set [big] heatproof serving bowl on rack, and heat oven to 200 degrees. Bring 4 quarts water to rolling boil in large stockpot. While water is heating, heat oil in large skillet over medium heat until shimmering, but not smoking. Add bacon and cook, stirring occasionally, until lightly browned and crisp. about 8 minutes. Add wine and simmer until alcohol aroma has cooked off and wine is slightly reduced 6-8 minutes. Remove from heat and cover to keep warm. Beat eggs, cheeses, and garlic together with fork in small bowl; set aside. When water comes to boil, add pasta and 1 tablespoon kosher salt; stir to separate pasta. Cook until al dente; reserve 1/3 cup pasta cooking water and drain pasta for about 5 seconds, leaving pasta slightly wet. Transfer drained pasta to warm serving bowl; if pasta appears dry, add some reserved cooking water and toss to moisten. Immediately pour egg mixture over hot pasta, sprinkle with 1 teaspoon sea salt flakes or 3/4 teaspoon table salt; toss well to combine. 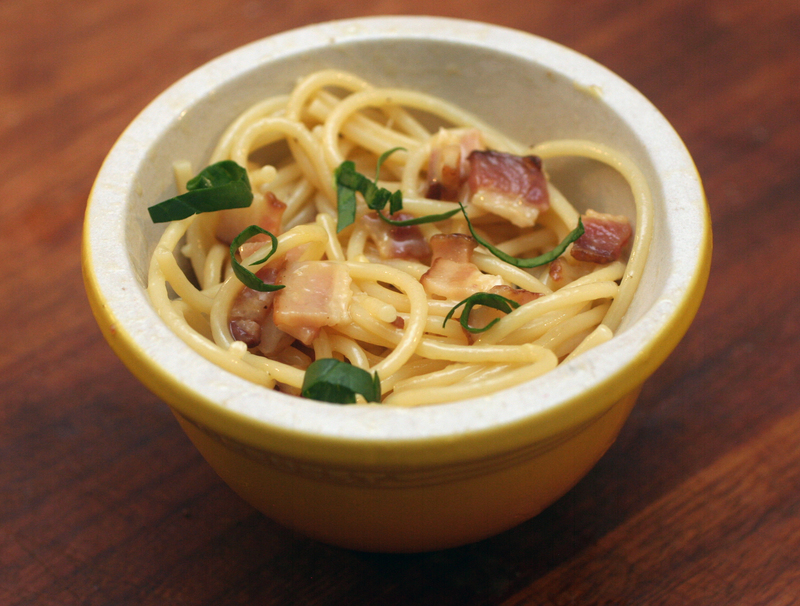 Pour bacon mixture over pasta, season generously with black pepper, and toss well to combine. Garnish with basil and serve immediately. i remember having this in brooklyn with johnny corks and the beeze, and it was SO delish.